Arstanbek Abdylaev, scourge of the Kyrgnet, has struck again. Noted  on Global Voices before for predicting a planet shorn of seasonal transition, this ex-presidential candidate and current head of the “People’s Academy” is back to tell the universe what he really meant, having been mocked and misunderstood by netizens back in November 2011. This time round , Asakeev was limited to a bit-part performance, his coveted position as Abdylaev’s number two apparently usurped by Pak. Pak, whose mastery of Russian exceeds that of both his colleagues, proceeded to explain that the original phrase “there will be no winter”, had been taken too literally, and that actually it had a “big energetic and informational bloc” capable of creating a “moment of total quantum leap” for humanity. “Four months ago we wrote to the Kazakh ambassador – we said, you are going to [suffer] terrorist attacks – mass upheavals  – they laughed at us. We wrote to the leader of the Russian Federation – Putin. We said that there would be war in Arabia, and they laughed at us, but there was [war]. Now my words are being proven, not by a historian, or an academic, or paper, but time,” Abdylaev said. Where could the press conference possibly go from there? Well, despite apparently being ridiculed by the Russian leadership, journalists heard, Moscow still has a place in Abdylaev’s New World Order – chiefly as the brawn behind Kyrgyzstan’s brain. Since Europe will soon be starved, disease-ridden and submerged under water, he reasoned, Russia would have no choice but to turn East. “Why are we writing to Russia? Russia and Kyrgyzstan will conserve humanity. That’s why I call Putin “a complex bio-robot”… We will give a program to the Russian leader, Putin, and he will do it, because he has the power,” Abdylaev said. With a bio robot, you give him a program and he does it, correct? But Putin is a complex bio robot – he himself does it. Perhaps this difficult, semi-mechanic nature is the source of Putin’s reputed marital troubles …. This phrase [there will be no winter]… is also a code. Anyone who has heard the phrase “there will be no winter” has already received the code and they are using it, even if they are not fully conscious of this. That code contained here among the Kyrgyz should arrive in every person, and through it every person should come to a condition of over-standing; they will become more than human and they will be aware of their true capabilities and their real meanings as human beings… This is why Arstanbek [Abdylaev] called Putin a bio-robot. Barack Obama is also a bio-robot. Other bio-robots stand behind these people and behind these people are other people and today these people are all bio-robots. This code [there will be no winter] allows these bio-robots to become human and write constitutions for the future era, the era we have called the golden era. So, what is this strange “People's Academy?” Aside from obtuse letters to world leaders, do they have any publications or academic accreditation? Increasingly they are beginning to sound like a cult, a fact that could get Abdylaev into trouble in a country where the state is often hostile towards obscure religious movements . “Who are they kidding, it has been -20 here for two weeks,” quipped [ru] alexxx8999  . “Is there a doctor in the studio! Or aren’t there any doctors in Kyrgyzstan? How can they allow abnormal people airtime?” asked [ru] breeedfrtf  . “Who let them off the building site?” asked [ru] TheMacsander , a probable reference to the fact that many Kyrgyz work abroad in Russia as labour migrants. “Judging by the commentaries, Russians differ from fascists only in their stupidity,” raged BeksKazama  in response. But other RuNet types saw reasons to envy their small, mountainous Central Asian neighbour, and took Abdylaev's public appearance as a cue to bash United Russia, the political machine that took victory in Russia's recent elections to the state Duma – a vote tainted  by allegations of massive fraud. 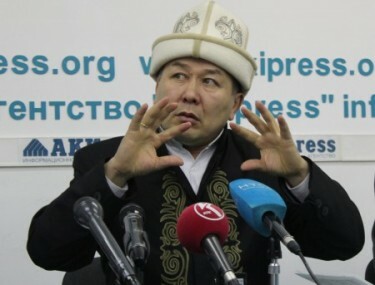 “Kyrgyz wake up, don’t call the Russians to your aid! Otherwise you will soon have United Russia and corruption, in other words the whole bouquet ‘from Russia with love! '” said [ru] marysimon79  . “O Great Valley of Chuika [Chui-grown marijuana] Ototo – there will be no winter,” said [ru] Mariyajuri . N.B According to Bishkek-based citizen media portal Kloop, Abdylaev's second press conference has already surpassed his first in terms of online popularity. Once again, the catalyst  for a spike in viewing figures was a prime-time slot on Russian satirist Stas Davydov's internet show “ThisisHorosho “.